Are theatrical dials for those with less exciting lives? Looks good. Handsome timepiece with a better improved rotating disc display as compared to the previous Harry Winston Tourbillon 7. Movement is complicated and visually appealing. Too much money for a brand name that has a less than positive value retention. Harry Winston releases the Histoire de Tourbillon 8, adding to a series of avant-garde tourbillon watches. The Histoire de Tourbillon 8 displays a disc hour and minutes with 2 bi-axial tourbillons. Roughly similar to the Histoire de Tourbillon 7, the watch is well-executed and attractive, but lacks a certain x-factor that would appeal to a collector crowd; who is notably growing more and more immune to unique time displays. The Harry Winston Tourbillon 8 in 18K white gold. The case is made of 18 K white gold, with an as expected rather large case size. The Harry Winston Histoire de Tourbillon 8 measures 51mm by 17mm. Thick even by today’s standards, but not without reason. Considering that the watch has to house the twin tourbillons and their incline movement, the dimension sizes up. 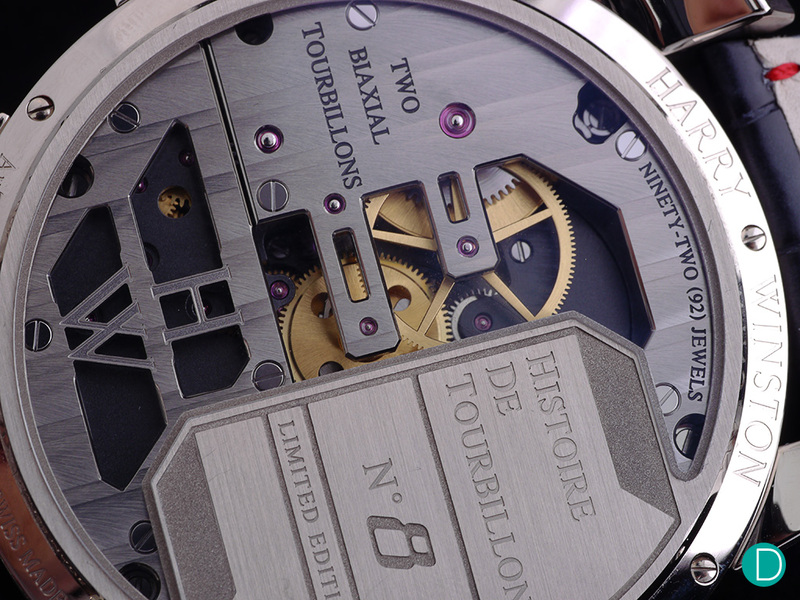 The twin tourbillons rotating on two axes. Apart from the fascinating dual bi-axial tourbillons, the dial side is animated with the ‘jumping’ time display. Instead of a traditional two-hands, Harry Winston uses a pair of rotating discs, an hour disc at the 1:00 position and minutes disc at 4:00. The rotating time discs from aluminum, and the tourbillon cages and movement bridges from titanium. Similar in style with Greubel Forsey and other modern independents, the watch uses a cut out dial, with a depth of movement on display. Animation from gear movements, disc jumping, tourbillon spinning are all part of the growing penchant for dial side theatrics. The dial features 13 different finishing methods, an aluminum hours and minutes disc and tourbillon bridges in titanium. But apart from the kinesthetic theatrics, the dial itself is a good culmination of fine finishing techniques. From complex honeycomb and engraved patterns at 12:00 to the more common angling, polish, sanding, and dressage, the dial side is executed with 13 different textured elements. A see through caseback reveals the caliber HW4503. 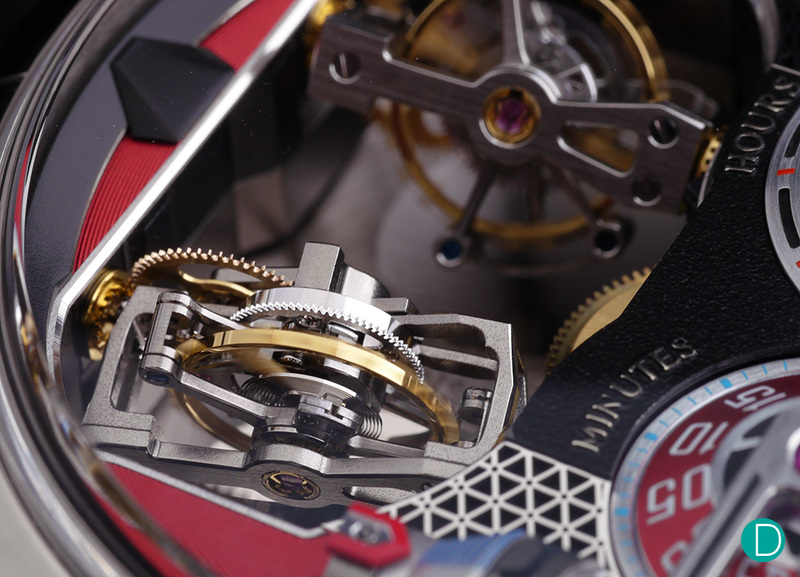 The watch uses the calibre HW4503, a twin tourbillon manual winding movement. 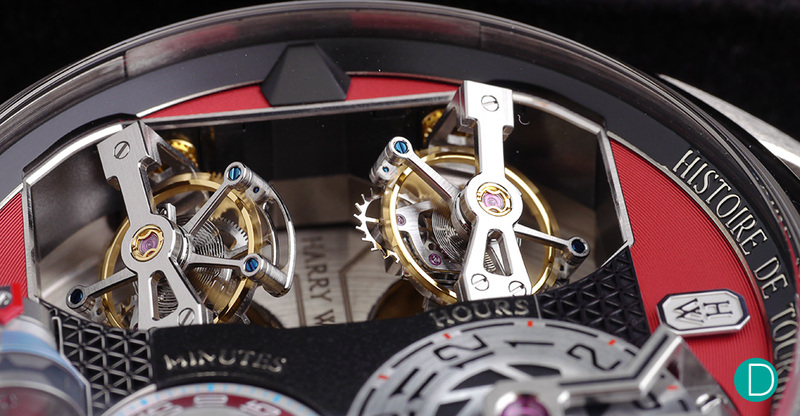 Both tourbillons rotate on a bi-axial trajectory, with a rotation on a 30-degree incline. 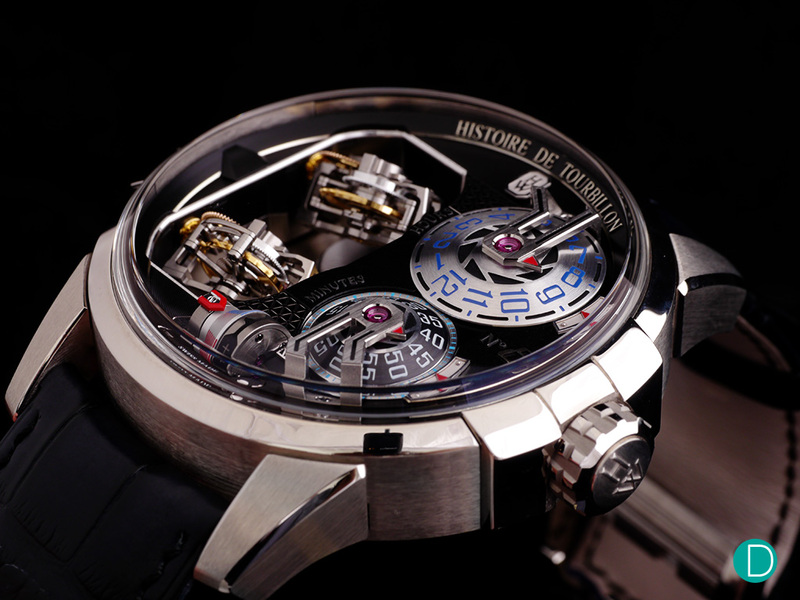 The tourbillons sit within a second cage that turns on its own axis, making a full rotation every 45 seconds. The watch runs at a rate of 21,600 vph and has a power reserve of approximately 55 hours. 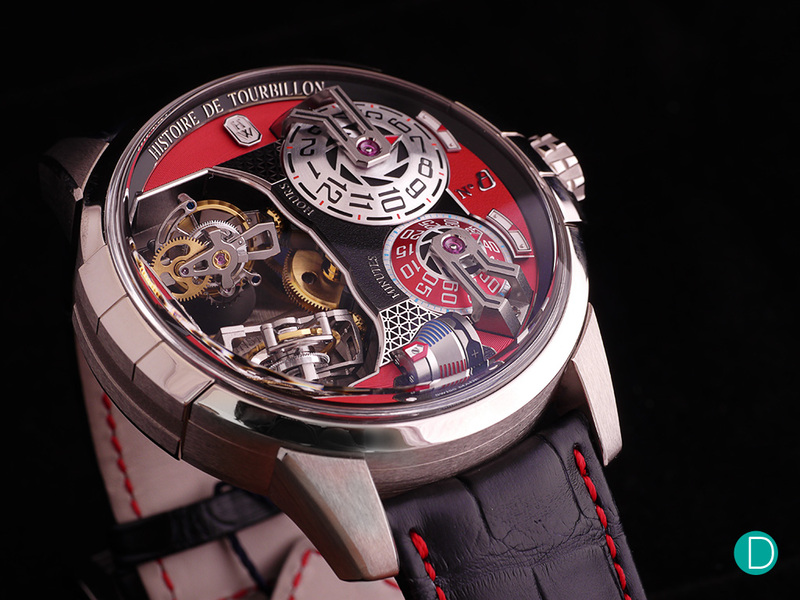 TheHarry Winston Tourbillon 8 is a limited production of 20 pieces, 10 in red and 10 in grey. A tourbillon was invented with the intention of creating a more accurate timepiece. A rotating balance wheel averages the different angles and movement on a wearer’s wrist and compensates for changes in time keeping accuracy due to different wear positions. 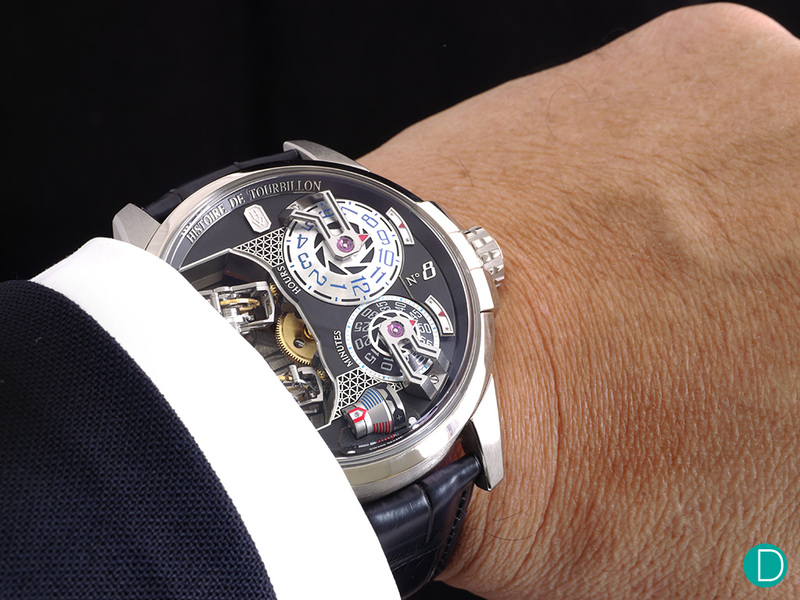 But with the Harry Winston Histoire de Tourbillon 8, the tourbillon concept is greatly propelled. It not only has two independently operating tourbillons, both operating on two axes, but that the two tourbillons are said to work out a better time telling accuracy than a regular tourbillon. Mechanical feat aside, time display has at times become more of finding an extremely complicated way to tell time, for the sake of design and mechanical show off. After a certain point, say pass the COSC standards, -3 to +5s that can be achieved on most modern timepieces, the extraordinary fan-fare for accuracy with million dollar investments and price tags are at best borderline foolishness. The watch in anthracite grey. The Harry Winston Histoire de Tourbillon 8 will be limited to a 20-piece production, with ten with the red dial, and ten in anthracite grey. Considering Harry Winston’s pricing on the previous Tourbillon 7 and the other watches in their Haute Horlogerie collection, prices are expected to be north of US$600,000.